Caster HQ's 4" X 2" Solid All Polyurethane Caster Wheels are completely non-marking and non-conductive. A solid Polyurethane Wheel eliminates the possibility of tread de-lamination you would normally see on a wheel with a metal or plastic center hub. 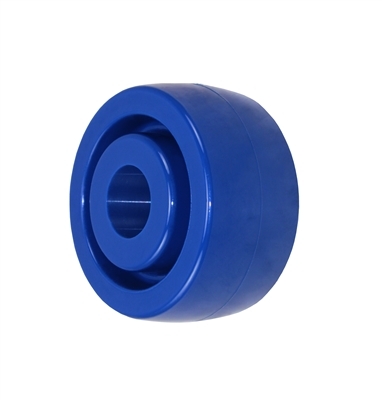 Solid Polyurethane Caster Wheels are designed to be used with Stainless Steel Casters in Corrosive and Wet environments. These are commonly used in Food Processing Plants, Hospitals, Animal Labs, Pharmaceutical Labs, and any application that requires clean sanitary operations and standards. Solid Polyurethane Wheels are not meant for applications that include abuse, shock load, poor floors, obstacles, or storage loads that sit for over 1-2 weeks at a time as the polyurethane could flat spot if loaded with the maximum weight and sits in one spot without being moved for long periods of time. Temperature Range: -20° to 180° F.
TEMP RANGE: -20° to 180° F.